There is an increasing number of areas in Ontario where ticks carrying Lyme disease are found. These black-legged ticks (also known as deer ticks) attach to birds, which migrate place to place, bringing this health risk. While Lyme disease is easily treated when detected early, it can have serious health consequences if left untreated. The Black-legged tick is a hard-bodied biting arachnid (related to scorpions, spiders and mites) that feeds on blood. Ticks can feed on mammals, birds, reptiles and amphibians and are most commonly found in outdoor areas like grassy fields, wooded areas, gardens and parks. However, ticks can be carried by birds or other animals they feed on and may be found outside these areas as well. Ticks cannot fly or jump. Instead, they wait for a host by resting on grasses and shrubs and when a host brushes the spot where they are resting the tick quickly climbs aboard their host. Ticks must have a new host (blood meal) at every stage in their life cycle to survive. This generally lasts two years and during this time they go through four life stages: egg. six-legged larva, eight-legged nymph and adult. Ticks vary in size and color, black/brown or grayish after a blood meal. In general, adults are approximately the size of a sesame seed and nyphal ticks are approximately the size of a poppy seed. 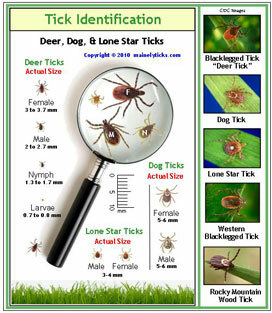 Ticks are very hardy; they can be one of the first invertebrates to become active in the spring and can be active even after a moderate to severe frost. 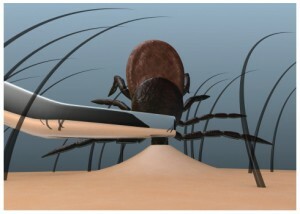 Ticks are most active during late spring and summer and at this time risk of human infection is greatest. The Black-legged tick is the main species of tick responsible for the spreading of Lyme disease in Ontario. However, not all Black-legged ticks carry Borrelia burgdorfert, the bacterium that cases Lyme disease. According to the Kingston Frontenac Lennox and Addington Health Unit, one in five ticks in their test areas tested positive for the bacteria. Ticks that do carry the bacteria are most likely to transmit the infection to humans if they have been attached for more then 24 hours. The bacterium requires time to travel from the tick’s gut to its salivary glands and this delay, along with quick detection and removal of the tick is one of the key methods of preventing Lyme disease. 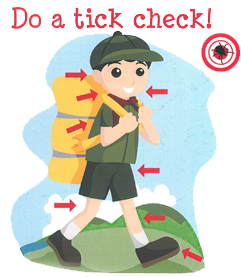 If you find a tick attached to your body, remove it as soon as possible. If it has been attached for more than 24 hours contact you health care provider about a preventative antibiotic to lower your risk of contracting Lyme disease. If you develop a bull’s-eye rash, fever, chills, extreme fatigue or flu like symptoms see you health care provider. Ticks like to live in humid wooded areas. Here are a few recommendations to make your yard less favourable for ticks.